Vampire Dust is an alchemical ingredient dropped by vampires. Up to 3 samples at 1.7% chance each or 1 sample at 2.3% chance: carried by Silver Hand members. Vampire dust is dropped by all vampires, including Ancient Vampires, Blooded Vampires, Master Vampires, Vampire Fledglings, Vampire Mistwalkers, Vampire Nightstalkers, Volkihar Vampires, Volkihar Master Vampires, as well as named vampires such as Alva and Laelette the Vampire. 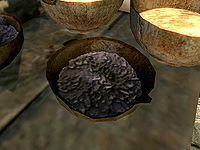 Hunting and GatheringDB: Collect a rare alchemy ingredient for Elynea Mothren.